Sony WH-1000XM2 Wireless Noise-Canceling Headphones are incredibly silent and effortlessly smart. Enjoy noise cancellation that adapts to you, where you go and what you do. Industry-leading noise cancelation is made even smarter, with personal and atmospheric pressure optimizing that adjusts to your individual listening style and your altitude. Smart Listening by Adaptive Sound Control automatically detects your activity such as traveling, walking, and waiting, then adjusts ambient sound settings to you. You can customize them with the Sony Headphones Connect App. Hear music that stays true to the original recording with High-Resolution Audio. Optimized for High-Resolution Audio, S-Master HX reduces distortion and allows you to enjoy all the subtleties in your music. These headphones also include a powerful 40mm driver with Liquid Crystal Polymer (LCP) diaphragm for handling heavy beats and can reproduce a full range of frequencies up to 40kHz. Experience audio optimized for different listening environments including outdoor stages, clubs, halls and arenas. Sony WH-1000XM2 Wireless Noise-Canceling Headphones let you hear what's important to you when you want. Adjust ambient sound with the Sony Headphones Connect App to hear essential sounds when you’re listening on the move. SMART LISTENING: Smart Listening by Adaptive Sound Control automatically detects your activity such as traveling, walking, and waiting, then adjusts ambient sound settings to you. SOUND OPTIONS: With High-Resolution Audio you hear music true to the original recording. Feel immersed in sound with Virtual Surround Sound and adjust settings to hear what is important to you with Ambient Sound Control. POWER: Keep the music playing with long battery life and quick charging, giving 70 minutes of play after just 10 minutes of charge. 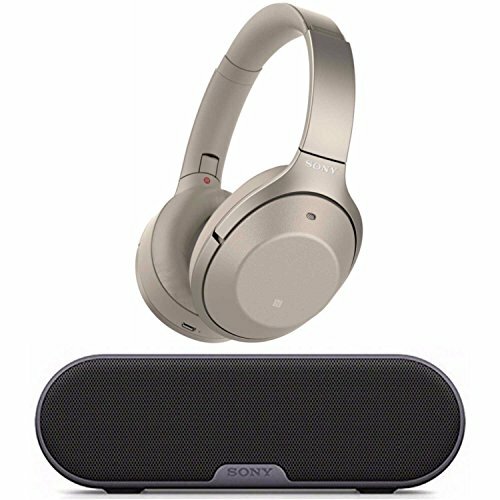 BUNDLED WITH: Sony SRS-XB2 Portable Wireless Speaker- Capable of Bluetooth and NFC connections this portable speaker will deliver big sound despite its small size.